Paracelsus, born Philippus Aureolus Theophrastus Bombastus von Hohenheim, was a Swiss German physician, chemist, botanist, alchemist, astrologer and general occultist who is famous for his iconoclastic rebellion against the conservative medical orthodoxy of his day, as well as for his bold, new ideas in medicine, psychology and the healing arts. During his life, he garnered a lot of fame for his cures and medical advances, which made him not only highly sought after as a physician and healer, but a controversial figure around whom many fantastic stories and legends accrued. He countered the old teachings of Aristotle and Galen with innovative and progressive theories of his own concerning medicine, chemistry, alchemy, and psychology. The famous spiritual psychologist Carl Gustav Jung saw in him a seminal figure in fusing the science of alchemy with psychology and the study of the unconscious. He is also widely held to be the father of chemical medicine, or chemotherapy, in Europe, as well as the science of toxicology. His ideas were also important to the founding of homeopathy as well. Paracelsus was born in the Swiss village of Einsiedeln in 1493; November 11th and December 17th are two different birth dates that are commonly given for him. His father was a German chemist and physician, and his mother was Swiss. In 1502, the family moved to Villach, Carinthia, in southern Austria, where his father worked as a physician, tending to the medical needs of the pilgrims there. While his father educated him in the fundamentals of medicine and chemistry, Paracelsus received a profound humanistic and theological education from both his father and the local priests in the convent school of St. Paul’s Abbey. At age 16, Paracelsus started to study medicine at the University of Basel, and later on in Vienna. He was awarded his doctorate degree from the University of Ferrara in 1515 or 1516. 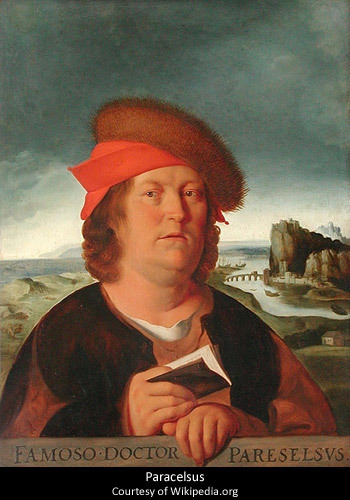 The professional life of Paracelsus was rough, and punctuated by periods of wandering; some of these wandering periods were voluntary, in the pursuit of medical knowledge from practicing alchemists and healers in the countryside, and some of them were forced upon him when he was rejected or ostracized by the medical and academic authorities in Basel and other cities in which he practiced. Paracelsus was extremely outspoken in expressing his views, deploring the antiquated way that medicine was practiced in blind adherence to the classics; he even burned the books of the old masters like Galen and Avicenna. He gained a reputation for being extremely pompous and bombastic, and took on the name “Paracelsus”, which means, “beyond or superior to Celsus”, a noted Roman physician and medical authority of antiquity. Due to their outspoken defiance of authority and the established order in their respective fields, Paracelsus was often compared to his contemporary, Martin Luther; he rejected that comparison, and said that Luther should speak for himself. Paracelsus remained a Catholic his whole life. In spite of his professional crises and setbacks, Paracelsus also managed to attain some notable successes. In 1536, Die Grosse Wundartznei, or The Great Surgery Book, was published, which helped greatly to restore his professional fame and standing. He also gained fame for being the physician who cured the successful printer and publisher Johann Froben. Erasmus of Rotterdam, who had many progressive and humanist friends at the university in Basel, where Paracelsus practiced, witnessed his treatment of Johann Froben first hand, recommended him to others, further enhancing his reputation as a physician and healer. Erasmus and Paracelsus maintained a lively correspondence. As a medical professor, Paracelsus was a staunch believer in the need for his students to study and learn all the natural sciences, especially chemistry. Paracelsus died in Salzburg, Austria on September 24, 1541, at the age of 47. Paracelsus was one of the first physicians to recognize and emphasize the use of chemicals and minerals in medical treatment; in this, many regard him as the father of synthetic chemical medicines and pharmaceutical drugs. He is also credited with the naming and discovery of Zinc, calling it “Zinke”, or pointed, from the shape of its crystals. He is also said to have developed the medicine Laudanum, an alcoholic tincture of Opium, which was in common use until the nineteenth century. Paracelsus was also one of the first to use opiates as anesthetics in surgery. In his wanderings throughout Europe, Paracelsus spent a lot of time in the Alps, studying the healing and therapeutic properties of the mineral waters at many spas and hot spring resorts. Paracelsus was always working to try to upgrade the status of surgeons, who were, in his day, regarded as little better than barbers. He also emphasized cleanliness and antiseptics in surgery, telling his students that if the surgeon only takes care to keep a wound from getting infected, Nature will take care of the rest, and heal the wound. In his rebellion against the staid traditionalism of the medical educational system of his day, Paracelsus shook up the field, and was a progressive voice calling for change and the influx of new ideas. He rejected the scholastic philosophy that permeated education in medicine and the sciences of his day, which revered and enshrined the books and teachings of Aristotle, Galen, Avicenna and Averroes, and their Catholic interpreter, Saint Thomas Aquinas. Paracelsus is said to have used special Mercury preparations to treat syphilis. Paracelsus wrote a major medical treatise entitled, On The Miner’s Sickness and Other Diseases of Miners, which focused on various treatment and prevention strategies for combatting silicosis and other occupational diseases of miners and metal workers. Paracelsus is commonly held to be the father of toxicology, and is famous for coining the aphorism, “The dose makes the poison.” In his opinion, substances that were virulent poisons in certain doses could be valuable therapeutic agents at other doses, a mode of thought that obviously inspired Homeopathy. Paracelsus, as a Renaissance physician practicing in the early 16th century, was influenced to a considerable degree by the Hermetic, Neoplatonist and Phythagorean philosophies then in vogue with the likes of Marsilio Ficino and Pico della Mirandola. He was a practicing astrologer, as were many physicians of his day, and designed and made astrological amulets and talismans for warding off various diseases, and for the various signs of the zodiac. Astrology was part and parcel of Paracelsus’ Hermetic worldview, which also incorporated the arts of alchemy and magic. The core of Hermetic philosophy is embodied in the maxim: “As above, so below; as within, so without.” And so, Paracelsus believed in planetary and alchemical correspondences for every organ and function of the human body, and maintained that a state of health and wellbeing was the result of a harmony between the microcosm of the human body and the macrocosm of Nature and the universe. In this worldview, each of the seven planets of classical astrology had a correspondence with a certain internal organ and a certain metal, for example. The Sun ruled the Heart, and its metal was Gold. The Moon ruled the Brain, and its metal was Silver. Mercury ruled the Lungs, and its metal was Quicksilver, or Mercury. Venus ruled the Kidneys, and its metal was Copper. Mars ruled the Gall Bladder, and its metal was Iron. Jupiter ruled the Liver, and its metal was Tin. Saturn ruled the Spleen, and its metal was Lead. And of course, the seven planets also have their correspondences with the days of the week as well. Although he largely rejected the scholasticism of Aristotle and Galen, as well as their theories of the elements and humors, Paracelsus, as a magician and metaphysician, still utilized the Four Elements for their various other subtle qualities, properties and attributes. As an alchemist, Paracelsus subscribed to the theory of the Tria Prima: that there were three different basic principles inherent in all matter, and these were Sulphur, Mercury and Salt. Sulphur stood for the fiery, volatile principles of a substance. Salt stood for the dense, solid and inert principles of a substance. And Mercury stood for the intermediate fluidic principles and essences that connected and communicated between the other two. The various diseases and disorders that the human body was heir to, said Paracelsus, were due primarily to poisonings, corruptions or imbalances within these three basic principles as they existed within the human body. And so, Paracelsus’ treatments for various diseases and afflictions were also geared towards treating the principle – Sulphur, Mercury or Salt – that was corrupted or out of balance. This could be likened to the Ayurvedic theory of the Three Doshas. In addition to the corruption of the Sulphur, Mercury and Salt principles within the human body, disease could also result from pathogenic forces and influences attacking the body from without. Above all, Paracelsus was an original medical thinker, and a medical populist of his day; some would even call him a medical revolutionary. Instead of the customary and academic Latin, Paracelsus taught his students in the colloquial German. He wanted to shake medical orthodoxy out of its deep slumber and hypnotic, blind obeisance to the scholastic dictates of the classical medical authorities. He felt that, in order to obtain real and practical healing knowledge, one had to leave the realm of academic medicine and apprentice oneself to gypsies, alchemists, folk healers and others who had a more direct and experiential knowledge of the healing art. Paracelsus remains a controversial figure to this very day, with some healers revering him, and others, especially many herbalists, despising him in his espousal of chemical medicines as taking man away from the healing ways of Nature, and Nature’s herbs. Certain ingredients in Maria Treben’s original Swedish Bitters formula are quite mysterious and mythical in nature. Manna recalls biblical stories of a divine food that rained down on the Israelites from heaven; actually, it is nothing more than a certain kind of sugar distilled from a species of Ash tree that has a mild laxative property. Theriac Venezian is another mysterious and fabled ingredient. Also called Venice Treacle, it is a kind of electuary or medicinal jam that dates back to Galen, and before him, to the Persian king Mithridates; it has the legendary reputation of being a universal panacea and an antidote to all poisons. The original formulation of Theriac Venezian had a considerable amount of opium in it, as well as other ingredients like viper flesh. Whatever their reasons may have been, Nature Works eliminated this controversial ingredient of Swedish Bitters and replaced it with Black Cohosh, which, I feel, destroys the whole energetic gestalt of the formula. In my online researches into Swedish Bitters and the Paracelsian connection behind it, I came across the website of a company called Amalux, which manufactures their own version of the formula which they claim is the original formulation of Paracelsus. I have included a link to their website in the sources cited below. Although they claim that the exact proportions of the various ingredients they list in the formula is a proprietary secret, there are, nevertheless, some interesting ingredients in it. First of all, they seem to go heavy on the Nutmeg and the Mace, which are two parts of the same spice-like fruit. Then, in addition to Calamus root, which I feel is a very desirable and effective ingredient, they include, of all things, Kaolin, which is a certain reddish type of clay with astringent properties. Again, it is their precise secret formulation of these ingredients, they claim, which contributes to the magical healing effects of this elixir. In addition to its use as a daily tonic for the digestive, circulatory, hepatic and female reproductive systems, Swedish Bitters can also be used as a dressing to heal wounds, cuts and bruises; it can even revive consciousness in fainting, due to its aromatic ingredients like Camphor. Being a medical philosopher and revolutionary who was so bold and outspoken in his opinions, it is hardly surprising that Paracelsus has left us with a great wealth of memorable quotes. Let no man belong to another who can belong to himself. He who is born in imagination discovers the latent forces of Nature… Besides the stars that are established, there is yet another – Imagination – that begets a new star and a new heaven. The universities do not teach all things, so a doctor must seek out old wives, gypsies, sorcerers, wandering tribes, old robbers, and such outlaws and take lessons from them. A doctor must be a traveler… Knowledge is experience.